Shandong Cuisine, one of the major styles of cuisine in China, took shape in the Ming (1368-1644) and Qing (1644-1911) dynasties, and was later introduced to the Yellow River valley and the areas to the north of the valley. Shandong Cuisine is mainly composed of Jinan and Jiaodong local dishes. Dishes of the Confucius Mansion have its own unique style and characteristics. Imperial and Beijing cuisine has absorbed good advantages from Shandong Cuisine. 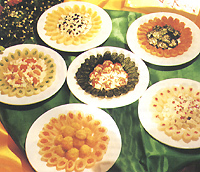 Major characteristics of Shandong Cuisine: (1) Prepared with a wide variety of materials. Jiaodong Peninsula is rich in marine resources. 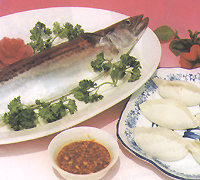 Jiaodong dishes are mainly made of aquatic products. People in Jinan and Jiving like to prepare cuisine with mountain delicacies and seafood delights, melons, fruits, vegetables and peppers. (2) A pure, strong and mellow taste, rather than a mixed taste. Chefs are good at using onions and seasonings. (3) Shandong Cuisine is known for its excellent seafood dishes and delicious soup. (4) Chefs excel at preparing clear, smell, crisp, tender and delicious dishes by frying, stirring and steaming. Famous dishes: Stir Fried Prawns, Fried Sea Cucumbers with Onions, Sweet and Sour Carp, Large Jiaodong Chicken Wings, Taishan Fish with Red Scales, etc. Shandong produces various kinds of wheat flour foods and snacks, such as Fushan Noodles, Weifang Chaotian Lightly Fried Dumplings, Jinan Sweet Crisp Cakes, etc. Jinan Cuisine features delicate aromas, pure taste, tenderness and a wide variety. Shandong Cuisine is famous for soup, and Jinan serves best soup. Jinan Cuisine includes 200300 kinds of dishes prepared with its unique technique, overall excellence in color, smell, taste and shape. As one of the oldest traditional dishes, Pucai in Milky Soup is famous for crunchy and tender vegetables and delicious soup, enjoying the reputation of the best dish in Jinan Cuisine. This dish took shape as early as in the Qing Dynasty, and has been loved by customers since then. Fried Two Kinds of Crisp Slices is a traditional dish of Jinan with a long history. It is said that this dish took shape in the mid Qing Dynasty, and became famous soon later. It was originally known as Fried Two Kinds of Slices. In the mid and later Qing Dynasty, this dish was introduced to Beijing, Northeast China and Jiangsu Province, enjoying a high reputation in the country. In bright reddish brown, this dish features soft and smooth sea cucumbers, and a good smell of onions with gravy. "Sweet and Sour Carp" is a traditional Jinan dish. As Jinan is located by the Yellow River, it teems with carps from the river, which are fat, with golden scales and a red tail. Delicious and tender, Sweet and Sour Carp is a must for banquets. Legend has it that this local dish originated from Luokou Town, a strategic town by the Yellow River, and was later introduced to Jinan. Now Sweet and Sour Carp has become a famous dish. Eating instant-boiled meat and vegetables has a distinctive flavor, with tender meat, and delicious soup, plus some chrysanthemums. Qingdao Cuisine is good at preserving the original tastes of various raw materials with soup, which is one of the characteristics of Shandong Cuisine. 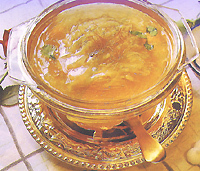 The adoption of clear and milky soup is the soul of Shandong Cuisine. Qingdao Cuisine, which presents the characteristics of Shandong Cuisine in a thorough way, not only preserves the nutrition, but also features delicious, refreshing, pure and light tastes. Chicken wings are placed on several kinds of local vegetables prepared with special broth, plus some onion oil peculiar to Shandong Province. This dish perfectly combines delicious broth and pleasant aromatic onions, fully displaying Shandong Cuisine's characteristics. 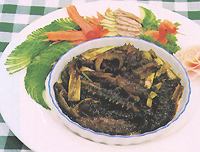 Sea cucumbers from the Yellow Sea and Bohai Sea taste both soft and tough, rich in nutrition. Minced Meat and Sea Cucumbers is one of the best local dishes. The cuttlefish's egg is a rare marine product, rich in protein. This tasty dish can help moisten the lung. Yantai Cuisine, which enjoys a high reputation both at home and abroad, includes many famous dishes, such as Shark's Fin with Crab's Meat, Shark's Fin in Clear Soup, Sea Cucumbers with Green Onions, Shrimp Roes and Sea Cucumbers, Minced Chicken Meat and Abalone, Stir Fried Fish Breasts, etc. In addition there are many dishes prepared with young seafood, which are tasty and delicious, with clear and refreshing soups and various shapes. Sea cucumbers produced in Yantai are precious seafood with high protein, low fat and low cholesterol. Green Onions with Sea Cucumbers, red in color, smells good and tastes delicious. Since ancient times, abalone has been regarded as the "crown of seafood." The Changshan Islands in Yantai produce the best abalone of China. Lotus Abalone is a famous dish which is named because of various ingredients and its shape. Dumplings with fish filling are famous traditional food in the coastal areas in Shandong Province, with thin and transparent dumpling wrappers, and juicy, white and tender filling. Delicious dumplings are well received by the people. Bean curd made with water from Mount Tai is especially delicious. 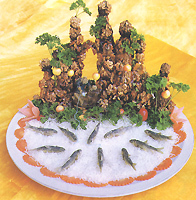 Thanks to the efforts of chefs, the "Mount Tai Bean Curd Banquet" has enjoyed a high reputation throughout the country. Mount Tai is rich in wild vegetables and Chinese herbal medicines. After meticulous preparations, the "Mount Tai Wild Vegetables Banquet" and "Mount Tai Herbal Medicine Banquet" are brought into forth. Fish with red scales is peculiar to Mount Tai. A large number of artificially bred fishes with red scales make it possible for more people to taste this delicious dish. Bean curd is cheap but good, and nutritious. In ancient China when emperors came to Mount Tai to hold sacrificial rites, they were served with vegetarian diet, including bean curd. Thanks to the study and practice by chefs of the past generations, Mount Tai bean curd dishes have become a rare flower in the delicacy garden. Now there are many famous dishes with bean curd as the main ingredient, such as Yipin Bean Curd, Eight Immortals' Gathering at Yaochi, Buddha's Hand Bean Curd, Ginseng Bean Curd, Lotus Flower Bean Curd, totaling more than 100 kinds, which have been well received by Chinese and foreign tourists. With peaks rising one higher than another, Mount Tai boasts a pleasant climate, plentiful water, and grows a great variety of Chinese herbal medicines. Chefs of Tai'an promote "Mount Tai Herbal Medicine Banquet" by making full use of Chinese herbal medicine resources, including various dishes which can help prevent and cure diseases, and prolong life, such as Steamed Glossy Ganoderma and Chicken, Steamed Glossy Ganoderma and Duck, Stewed Mutton with the Tuber of Multiflower Knotweed, Steamed Four-leave Ginseng and Chicken, Ginkgo and Upper Part of Pork Leg, Apricot Kernel and Bean Curd, and so on. Fish with red scales used to be presented to the emperors in the Qing Dynasty. Living in the mountain streams with an elevation of 270 m to 800 m in Mount Tai, this fish is less than 20 cm long, featuring a beautiful shape, tender meat, less fish bones and high nutritious value. The common dishes include Deep-fried Fish with Red Scales, Fish with Red Scales in Boiling Water, Fish with Red Scales with Phoenix-shaped Tail. Many kinds of wild vegetables grow in the open areas and forests and by streams in the mountains. As natural green food, they are of rich nutritious value, and good to the people's health. Dating back to ancient times, the Chinese people began to eat wild vegetables. Every year when the emperors came to Mount Tai to hold sacrificial rites, they had only vegetarian diet to clear up their bodies and minds. Monks in the temples and monasteries and local folks often eat wild vegetables.